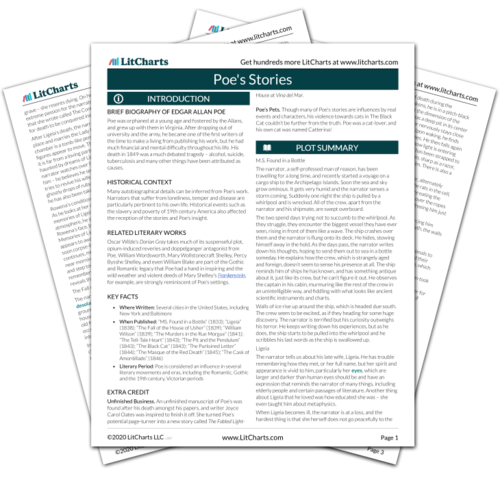 Instant downloads of all 946 LitChart PDFs (including Poe's Stories). 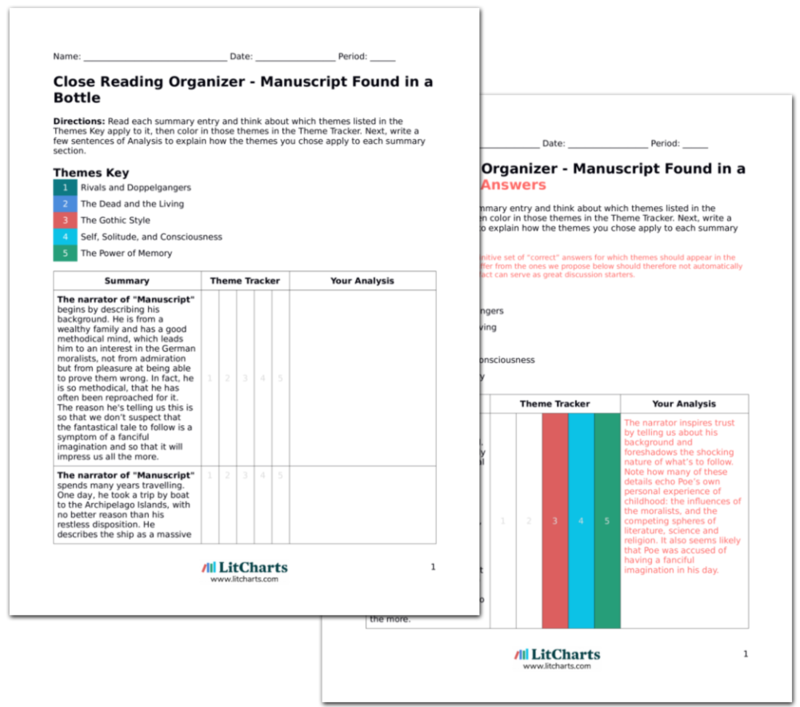 LitCharts assigns a color and icon to each theme in Poe's Stories, which you can use to track the themes throughout the work. In each story, it is the threat of death that pulls the plot along and that creates the suspense that Poe's stories are famous for. In The Pit and the Pendulum, the expectation of death, first by hanging, then with the pendulum, then into the pit, forces the narrator to confront his own mortality time and time again. In The Masque of the Red Death, death is personified and hangs over the story as a charismatic figure. This obsession with death can lend a menacing, almost masochistic tone to the stories’ voices, and a feeling of unavoidable motion in the plot, as if the characters are in a downward spiral towards their ends. But at times, the difference between life and death is not clear-cut, and this haziness between life and death only adds to the menace of the stories. Sometimes Poe’s characters come back from death or are in a constant state of ghostliness or unreality. In Ligeia, for example, death is not the end at all, and the line between death and life and ghostly purgatory keeps changing and dissolving, allowing Ligeia and Rowena to slip in and out of mortality. In M.S. Found in a Bottle, the whole crew of the ship that the narrator finds himself seems unable to die or really live. Nearly all of his stories explore the way death haunts or impacts the living, and the porousness between death and life, life and death, in these stories makes that haunting feel real to the reader. The ThemeTracker below shows where, and to what degree, the theme of The Dead and the Living appears in each story of Poe's Stories. Click or tap on any chapter to read its Summary & Analysis. Below you will find the important quotes in Poe's Stories related to the theme of The Dead and the Living. A feeling, for which I have no name, has taken possession of my soul – a sensation which will admit of no analysis, to which the lessons of bygone times are inadequate, and for which I fear futurity itself will offer me no key. The crew glide to and fro like the ghosts of buried centuries; their eyes have an eager and uneasy meaning; and when their fingers fall athwart my path in the wild glare of the battle-lanterns, I feel as I have never felt before, although I have been all my life a dealer in antiquities, and have imbibed the shadows of Allan columns at Balbec, and Tadmor, and Persepolis, until my very soul has become a ruin. All in the immediate vicinity of the ship is the blackness of eternal night, and a chaos of foamless water; but, about a league on either side of us, may be seen, indistinctly and at intervals, stupendous ramparts of ice, towering away into the desolate sky, and looking like the walls of the universe. They were, I must believe, far larger than the ordinary eyes of our own race. They were even fuller than the fullest of the gazelle eyes of the tribe of the valley of Nourjahad. Yet it was only at intervals – in moments of intense excitement – that this peculiarity became more than slightly noticeable in Ligeia. The night waned; and still, with a bosom full of bitter thoughts of the one only and supremely beloved, I remained gazing upon the body of Rowena. I had swooned; but will not say that all of consciousness was lost. What of it there remained I will not attempt to define, or even to describe; yet all was not lost. In the deepest slumber – no! In delirium – no! In a swoon -- no! In death – no! even in the grave all is not lost. Else there is no immortality for man. Looking upwards I surveyed the ceiling of my prison. […] In one of its panels a very singular figure riveted my whole attention. It was the painted figure of Time as he is commonly represented, save that, in lieu of a scythe, he held what, at a casual glance, I supposed to be the pictured image of a huge pendulum, such as we see on antique clocks. I took from my waistcoat-pocket a pen-knife, opened it, grasped the poor beast by the throat, and deliberately cut one of its eyes from the socket! I blush, I burn, I shudder, while I pen the damnable atrocity. Parfitt, Georgina. "Poe's Stories Themes: The Dead and the Living." LitCharts. LitCharts LLC, 8 Oct 2013. Web. 25 Apr 2019. Parfitt, Georgina. "Poe's Stories Themes: The Dead and the Living." LitCharts LLC, October 8, 2013. Retrieved April 25, 2019. https://www.litcharts.com/lit/poe-s-stories/themes/the-dead-and-the-living.